How do you get to be the god of wisdom like Ganesha? By religiously following the discipline of Full-Body Immersion (FBI). 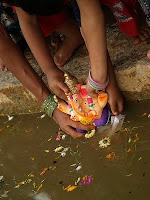 You will get a first-hand experience if you are in India during Ganesha festival around this time. You will say, I am joking, right? Ok, so let’s take a semi-god instead of god, like, say Bill Gates and see if our claim holds. During his Microsoft days Bill Gates performed a twice-yearly ritual known as “Think Week”. During this seven day period Bill would take off to a cottage on a quiet waterfront. All outside visitors – including family and Microsoft staff – are barred except for a caretaker who slipped him two simple meals a day. And what would Bill do for the whole week? He would have taken 100+ technical papers with him mostly written by Microsoft employees and selected by his technical assistant. He would spend long hours (as many as 18 hours a day) reading on average 15 papers per day and typically hit a century by the end of the week. His record score is 112 papers. It is during Think Week that Bill came across a paper “The Internet Tidal Wave” that led Microsoft to develop its own Internet browser. Similarly focus on security and online video game business has resulted from Think Weeks. He would also send e-mails to hundreds of people and write Think Week summary for executives. He would send his top executives a reading list. He can’t casually say, “Cool stuff” because this email might result into 20 people getting assigned to the project. So is, FBI enough? There are so many of you who might be saying – I don’t go on a waterfront but I am immersed in my work day-in and day-out. But I don’t get ideas like Bill Gates. Well, perhaps FBI is not enough. You need to synthesize your experience and take a position on what ought to be done. I have met so many engineers who would have spent 5+ years maintaining and enhancing a complex system (such as a telecom switch) and can’t write a 2-page position paper on how the system can be improved. I am not surprised that organizations like P&G have made FBI an integral part of their business process. For example, see Immersive research: P&G’s approach of getting deep customer insights. How I wish we can get almost a full-year just for synthesis, like Ganesha!